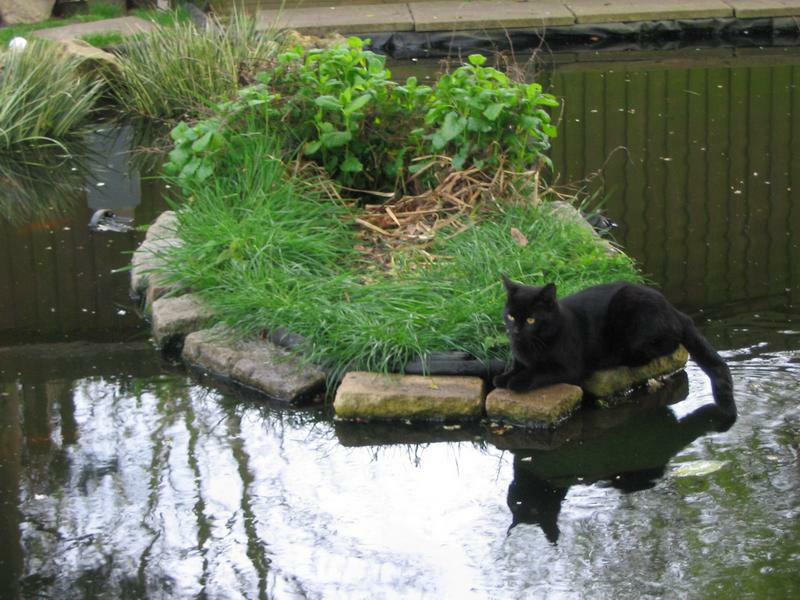 Photos taken in the garden during 2010 and 2011 of crows, herons, starlings, foxes, cats, fish, toads and tadpoles. 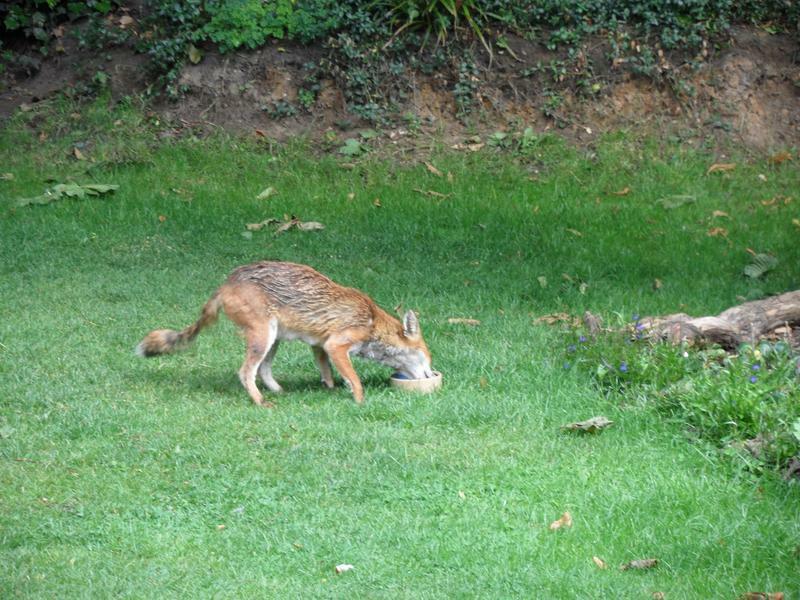 survived and be seen with their parents eating a lamb bone. 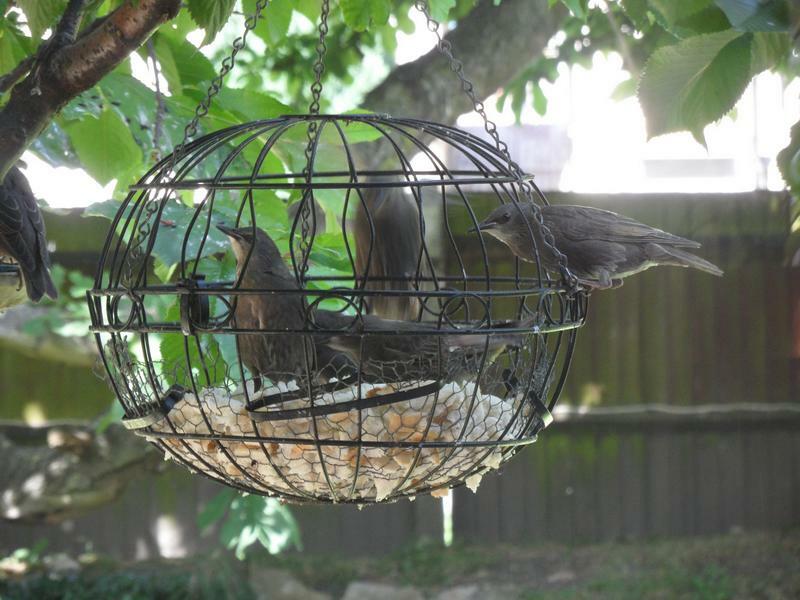 The family stays together for a few months, splitting up during the winter. 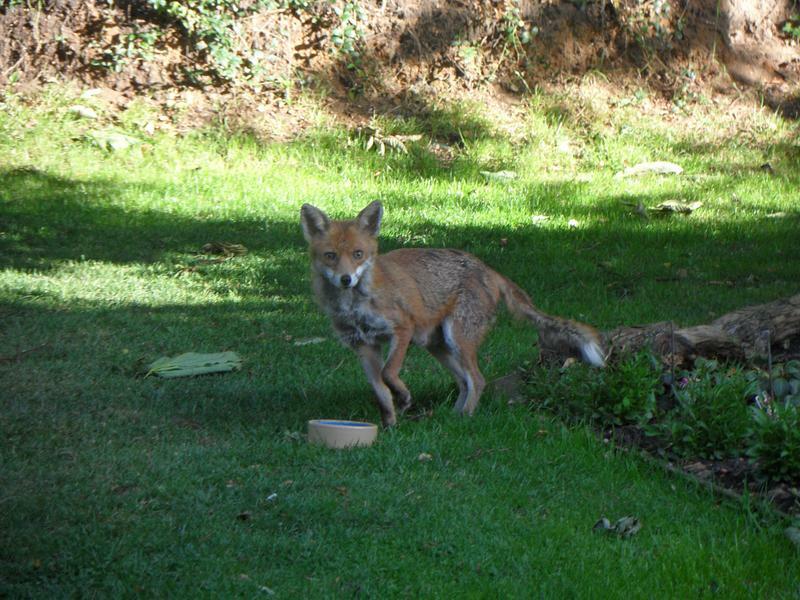 neighbouring houses and the foxes. 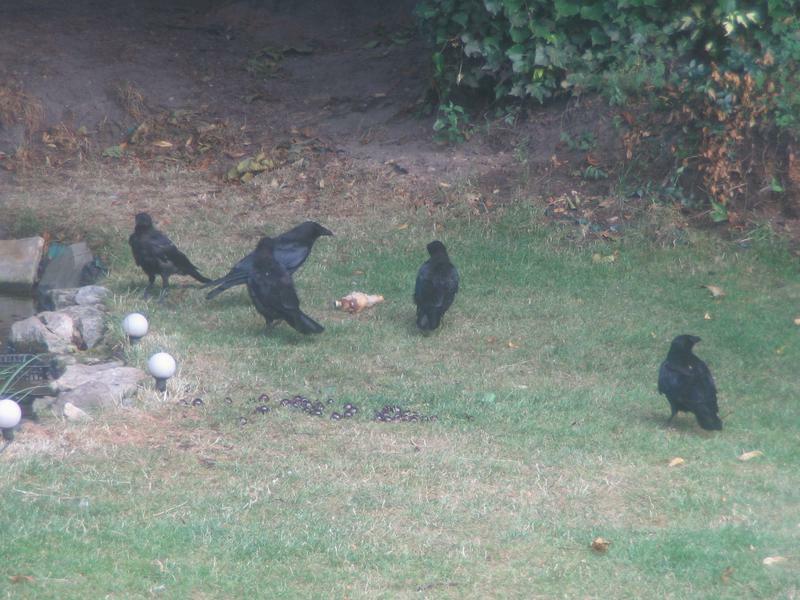 The crows get very noisy if beaten to the food. 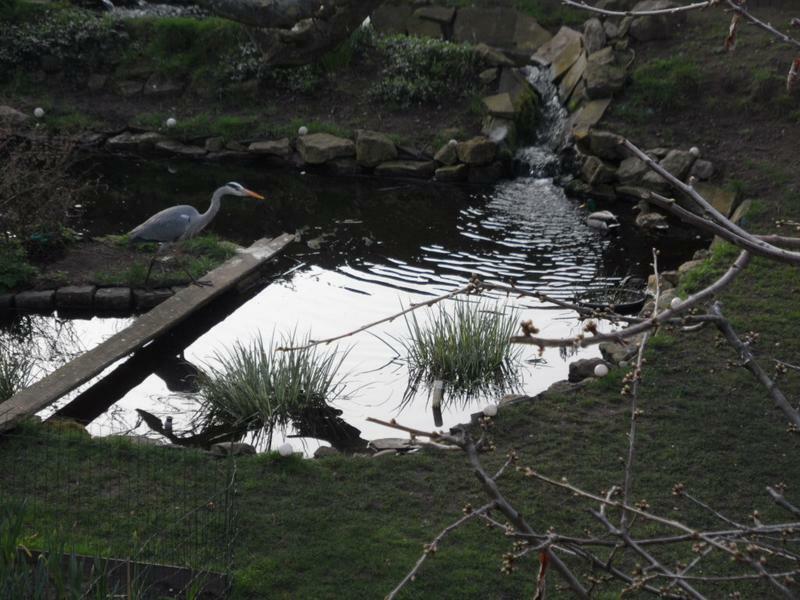 the plank bridge, watched by two ducks near the stream. off rather than taking photos of it. 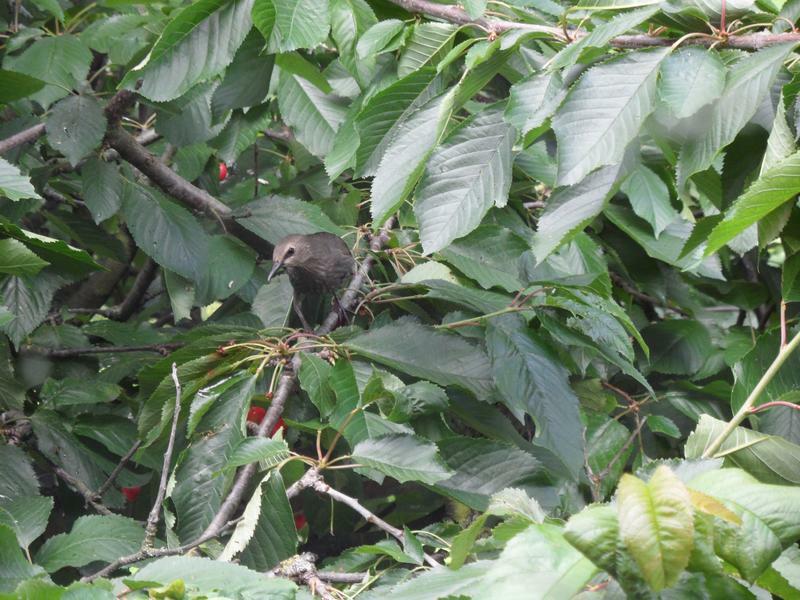 eating two loaves a day during fledgling, before natural food becomes available such as the cherries on the same tree. until I came out with a bowl of dog biscuits or uneaten cat food, and would start eating when I was 10 feet away from the bowl. 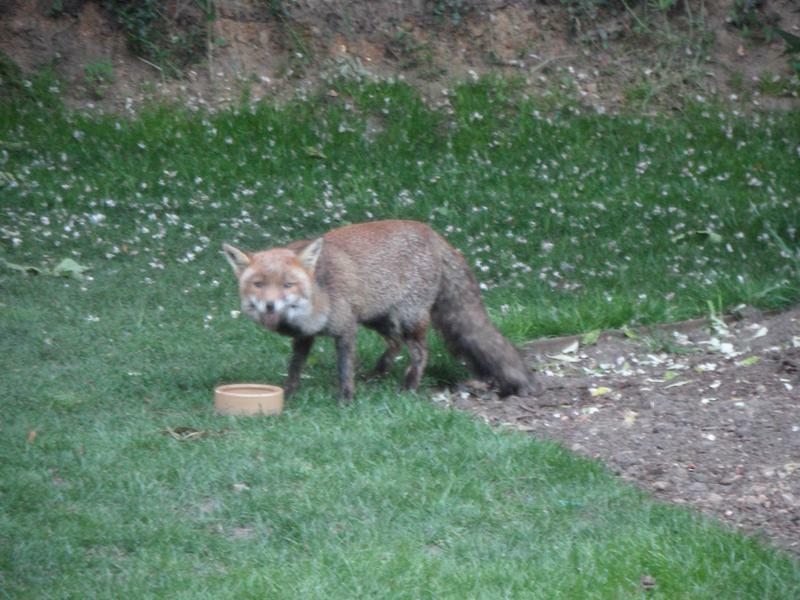 May 2011, a hungry and sorry looking young fox spent a few hours in my garden, then in my neighbours. 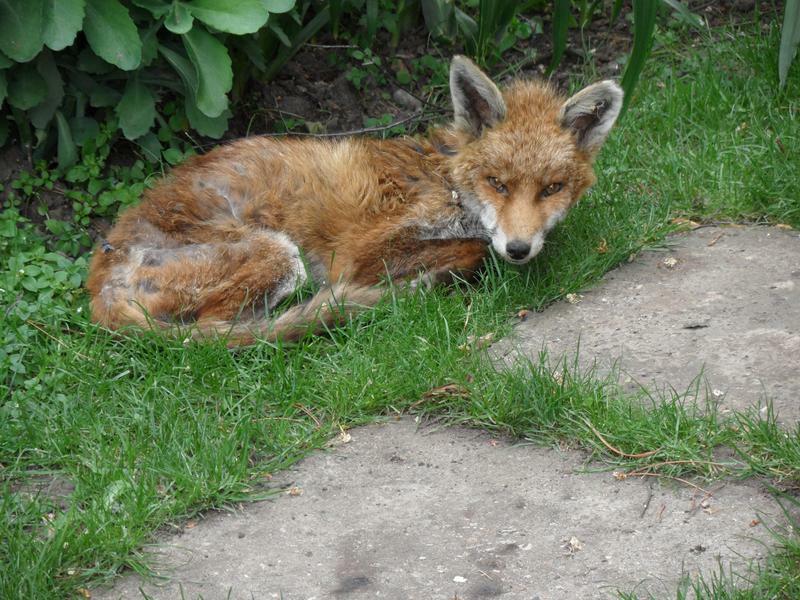 Same young fox, kept moving a few feet and then going to sleep again, oblivious to my taking photos of her. 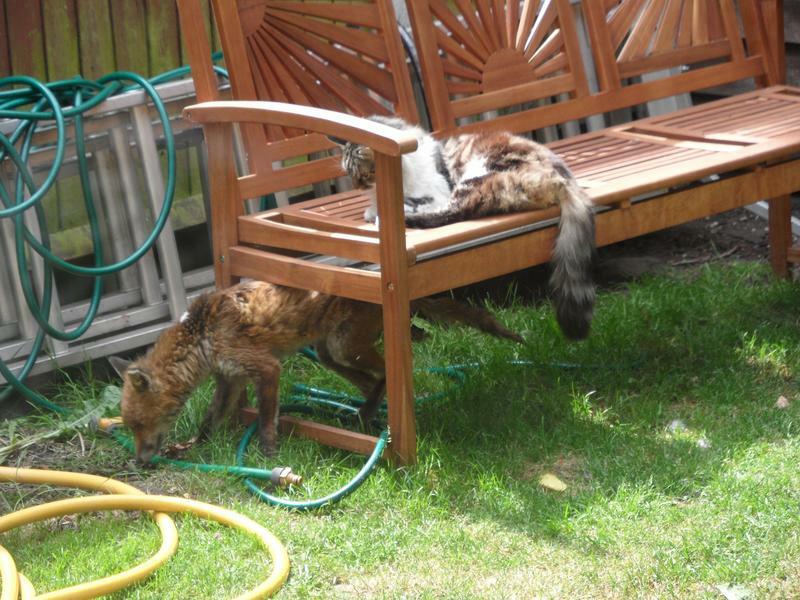 Same young fox, ignoring Susy the cat. 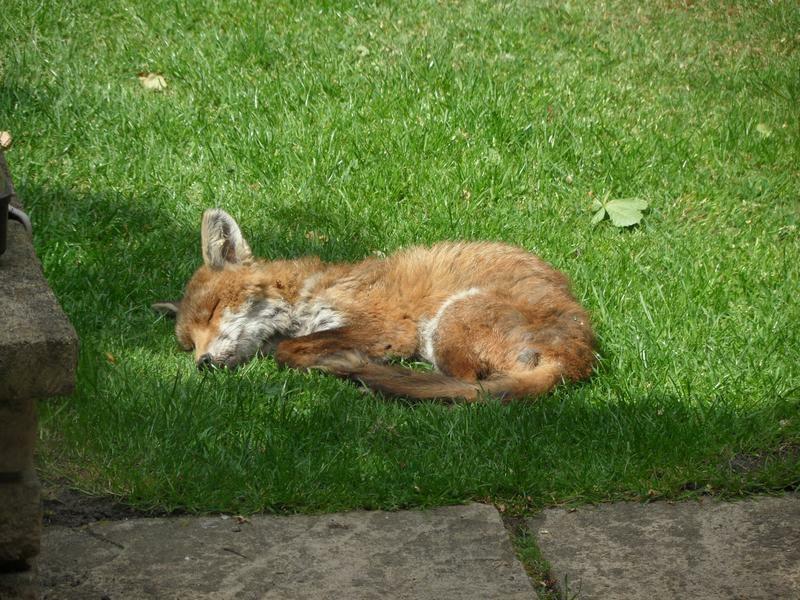 She then went to sleep next to the hose. 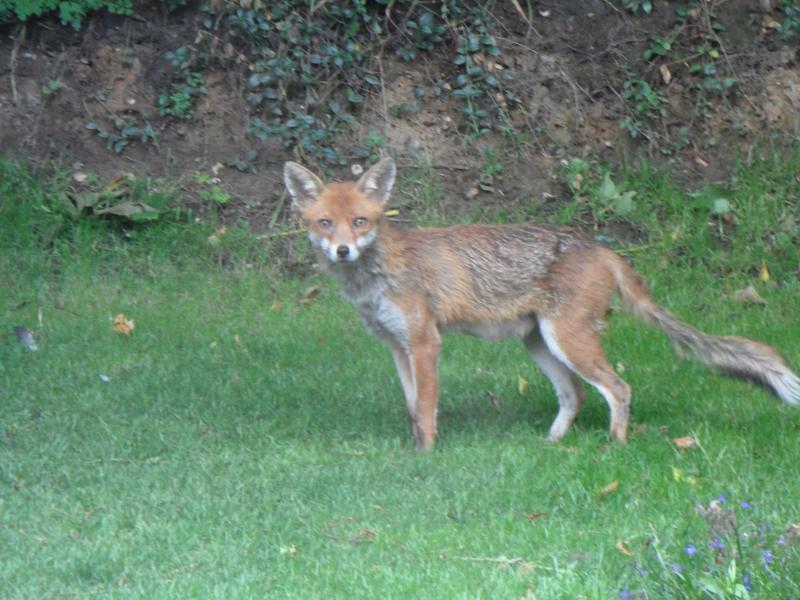 And again, moved down the garden 10 feet. 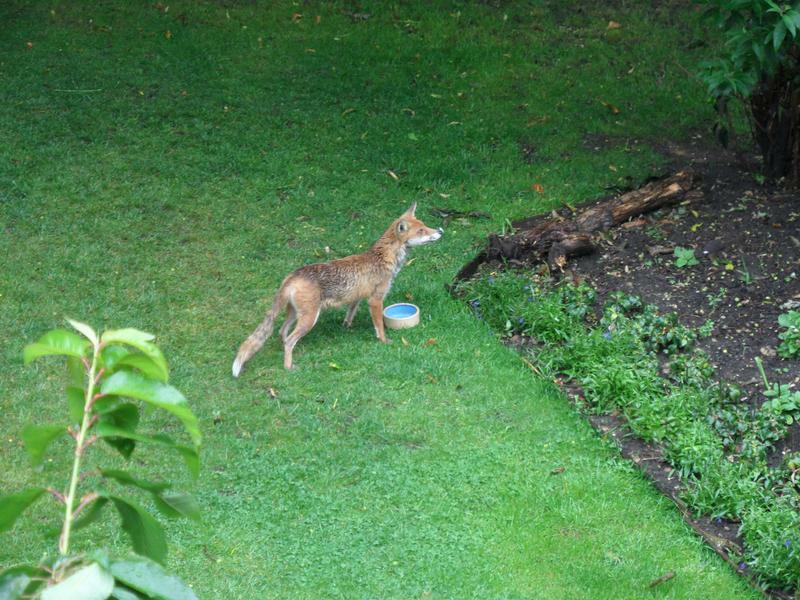 The young fox still coming back for meals twice a day. 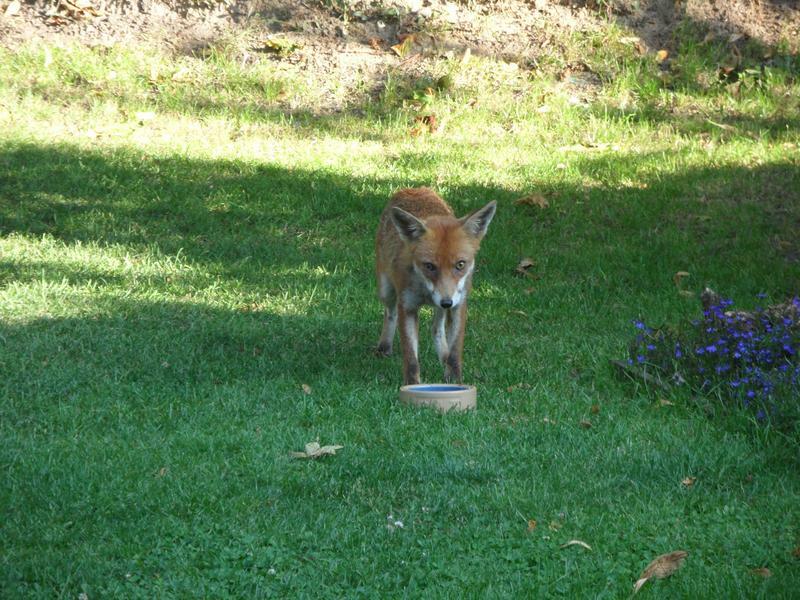 Ditto, early morning, sometimes it's a race between cats, crows and the fox who gets to the food first. 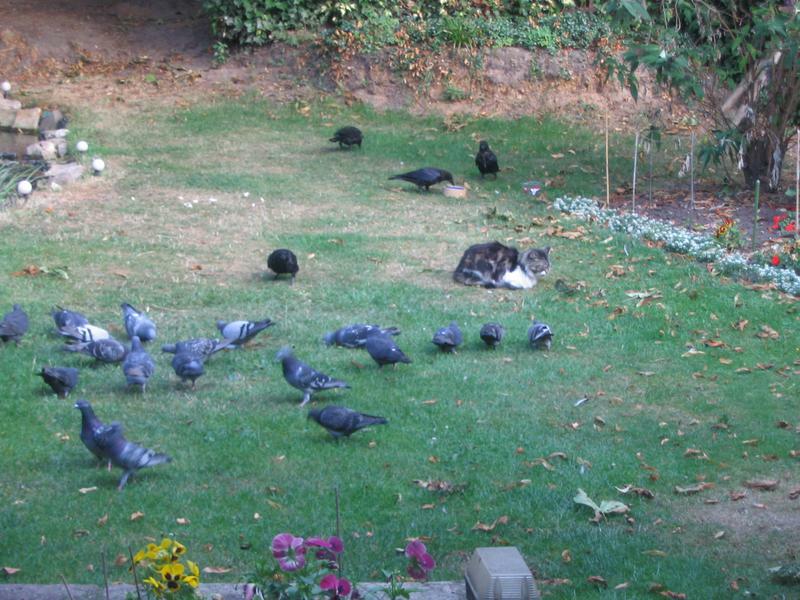 evening and fight over the food. 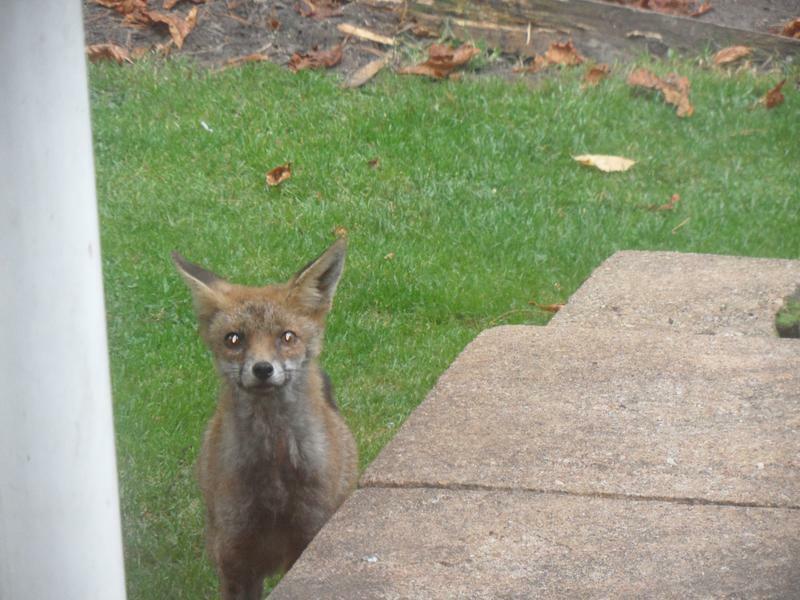 The fox watching me in the kitchen window one morning, expecting a meal. 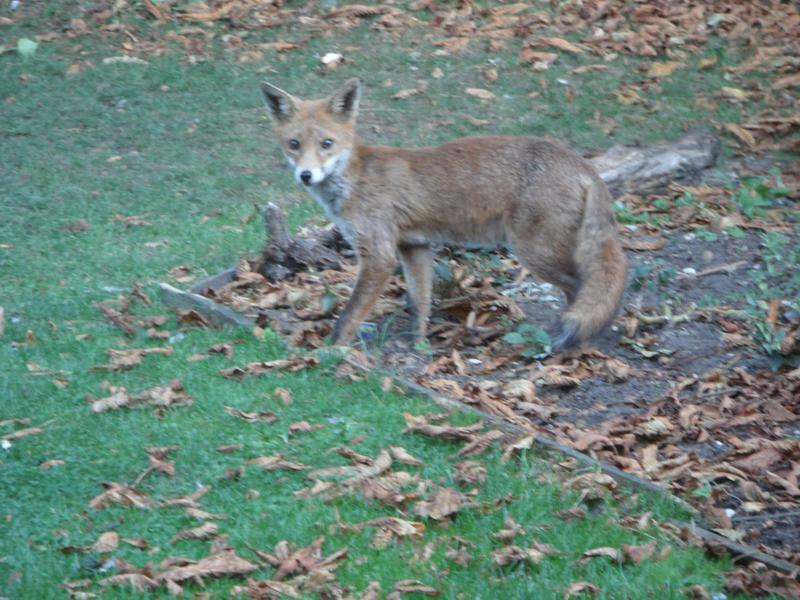 During the day, the fox often sleeps at the end of the next garden on piles of leafs, here seen disturbed and running away. 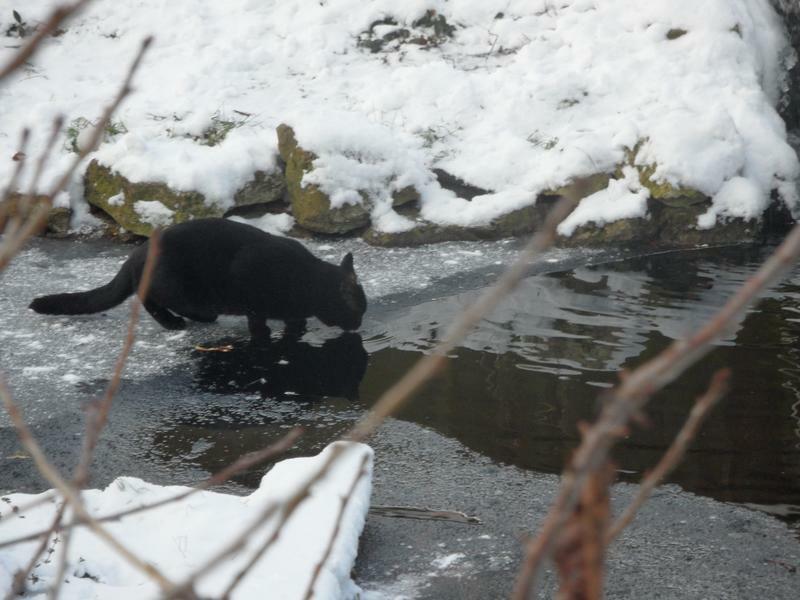 I've seen the fox jump onto the island, but this was the first time a cat had done so. 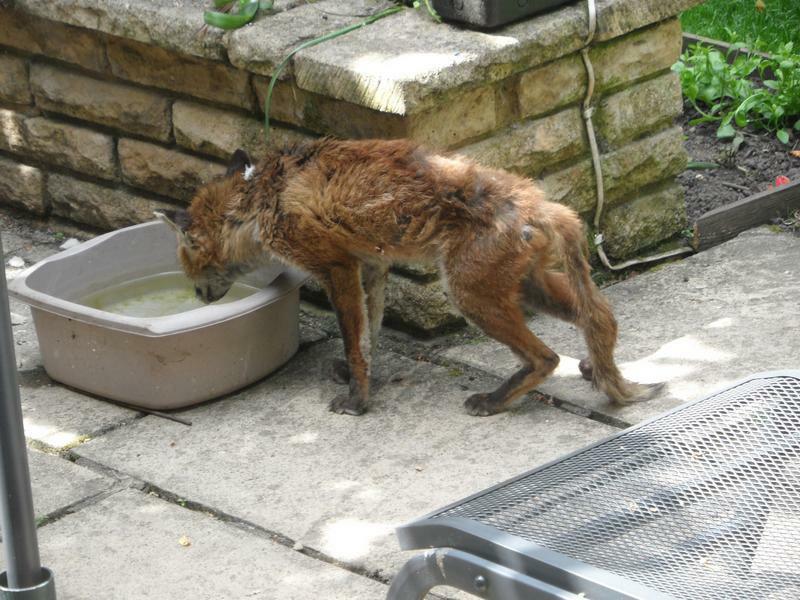 This is Elvis, a stray that comes for food daily. 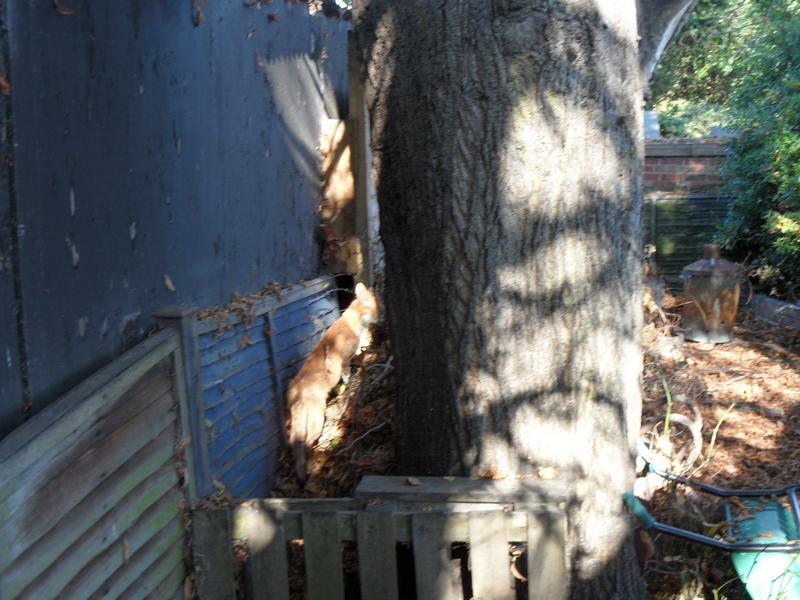 the duck nest can be seen, but no eggs this year. 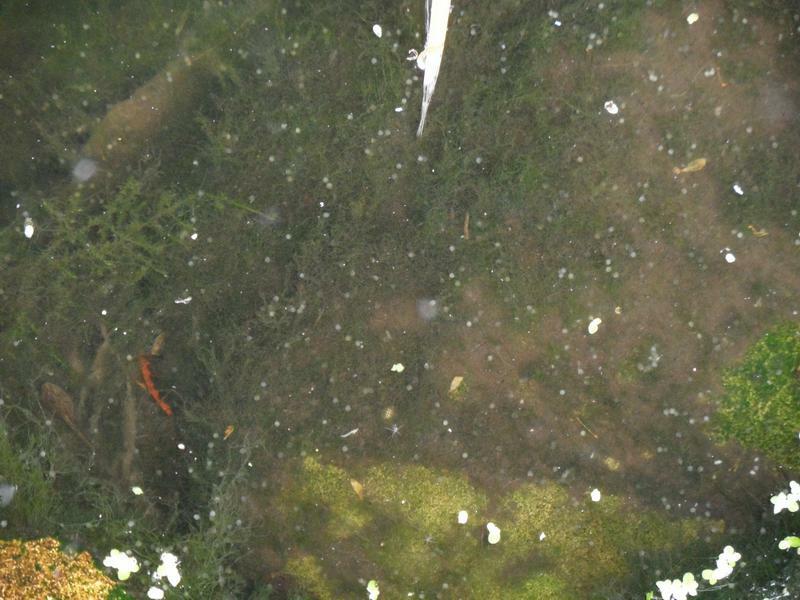 June 2011, a hundred odd small fish, probably comets, about one year old. 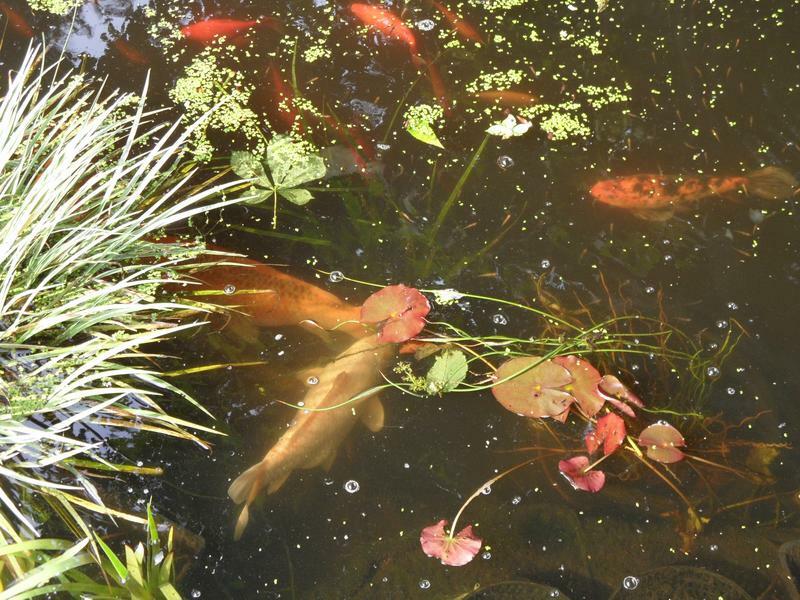 June 2011, some koi in the pond. 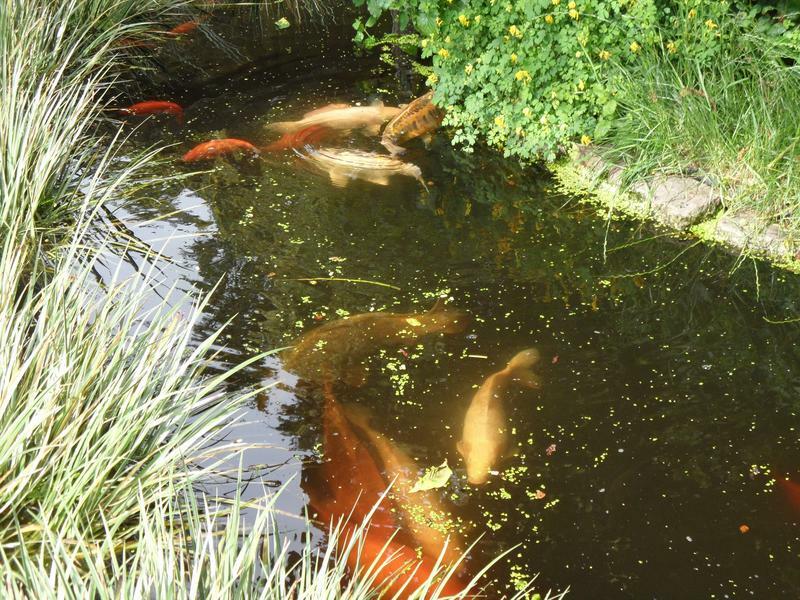 where they all go mad, with male fish wildly chasing females around the pond, with lots of splashing. 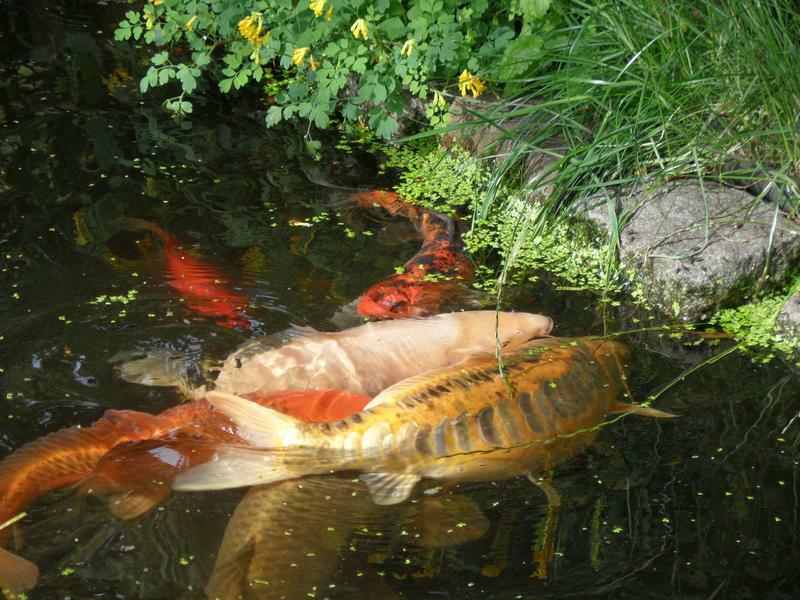 The koi mating, some are almost two feet long. impossible to get rid of. 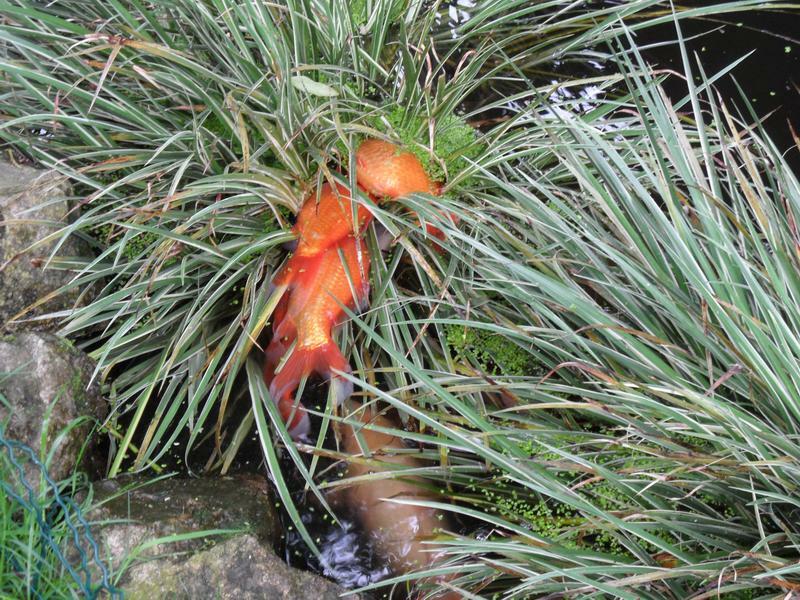 June 2011, some small carp or gold fish laying eggs on the plants. 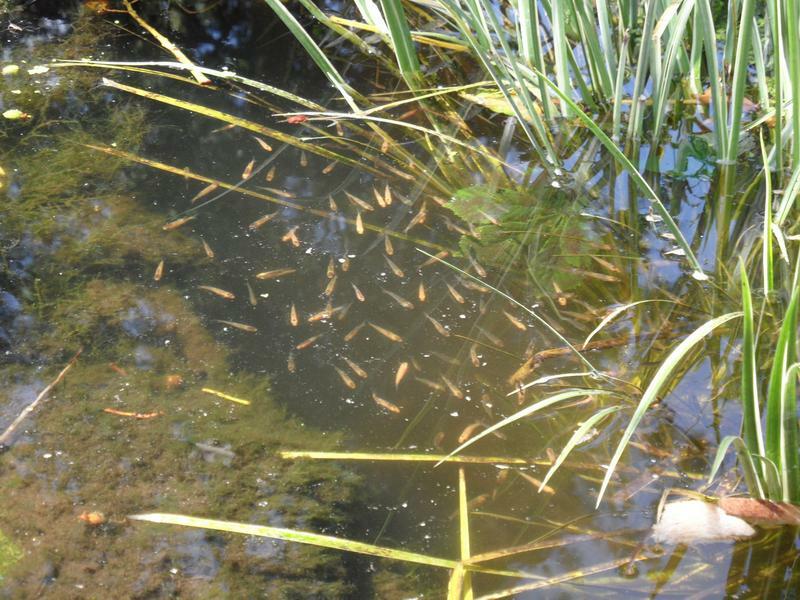 Hard to see, but all the little white spots are fish eggs, laid on pond weed on the side on the pond. 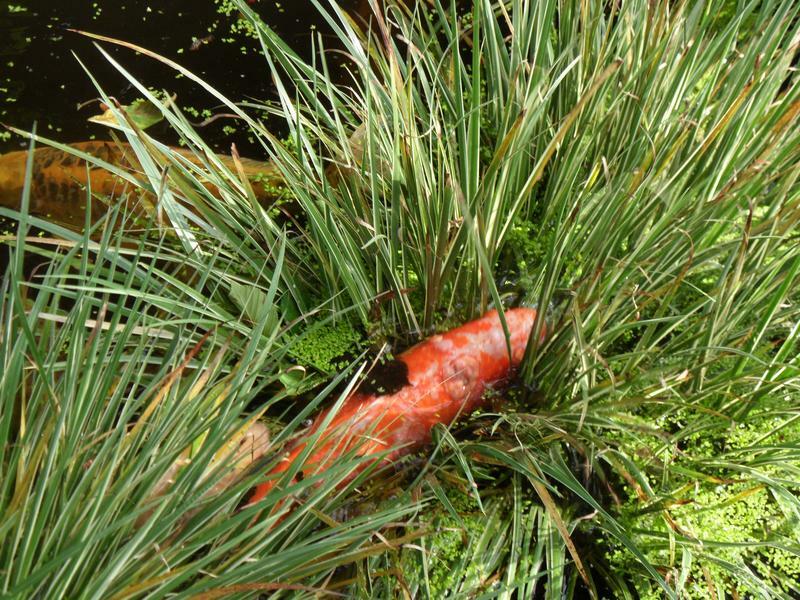 A lot will become fish food. 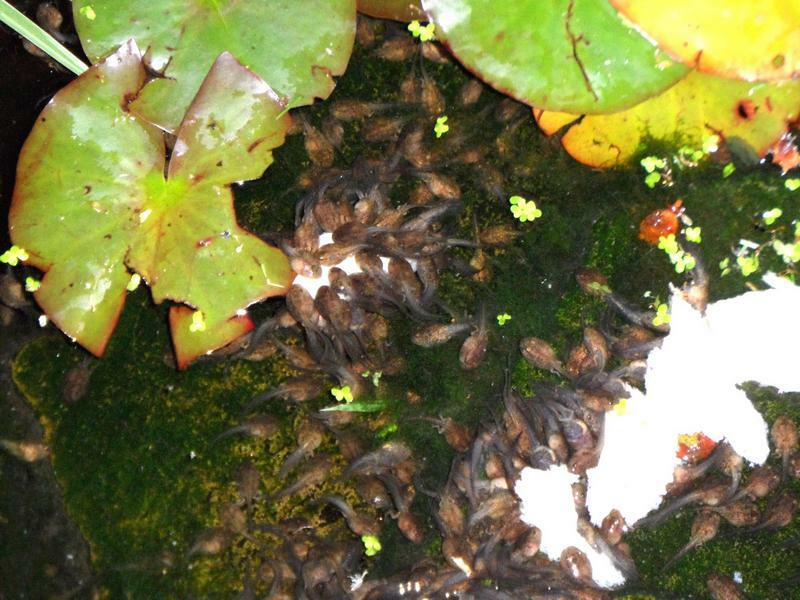 the day, but there were at least 50 mating pairs and 200 more boys on the lawn and in the pond, so it gets congested at night. 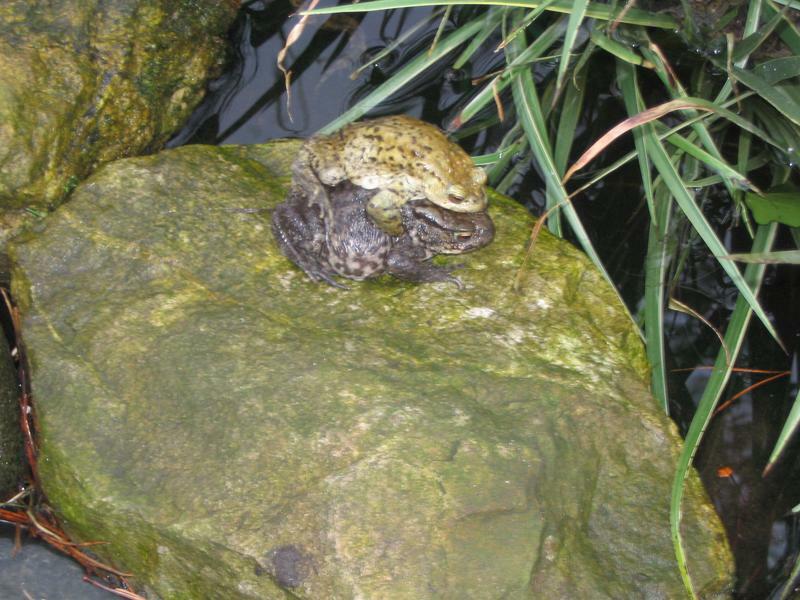 female frogs only appear for mating, likewise the toads spend the rest of the year on land. 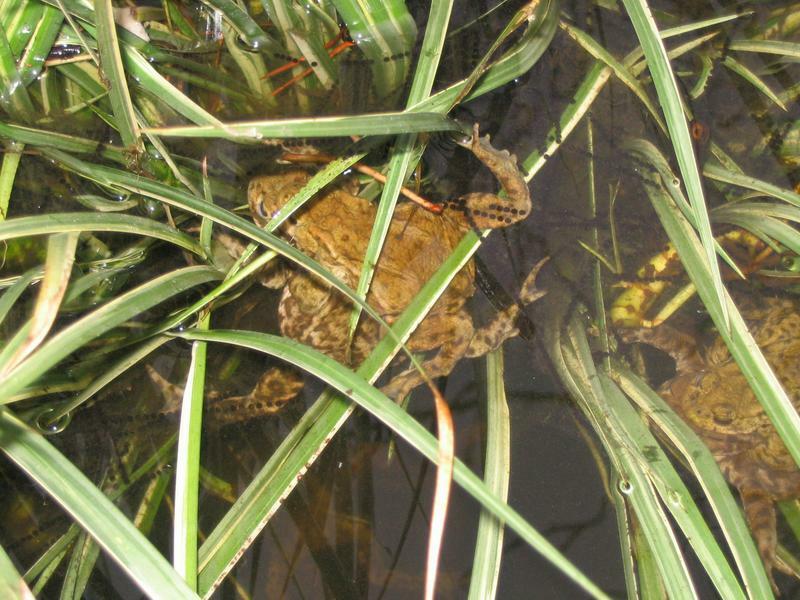 A male toad on top of a female, again in daylight so possible crow prey. 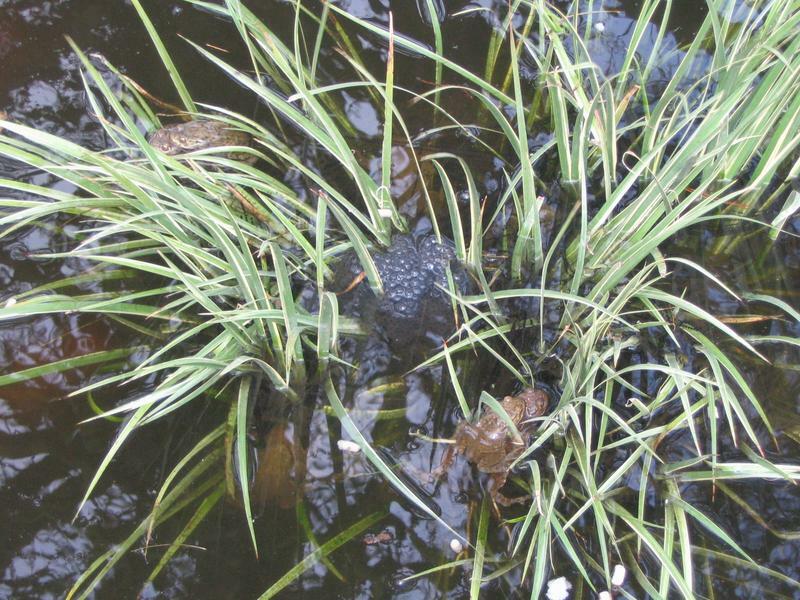 with tracks caused by the tadpoles eating it. 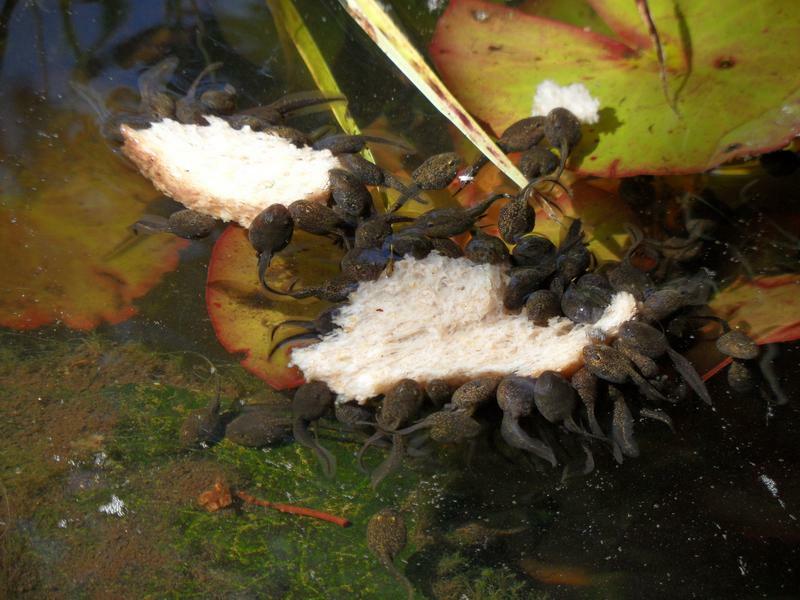 No idea if these are toad or frog tadpoles. 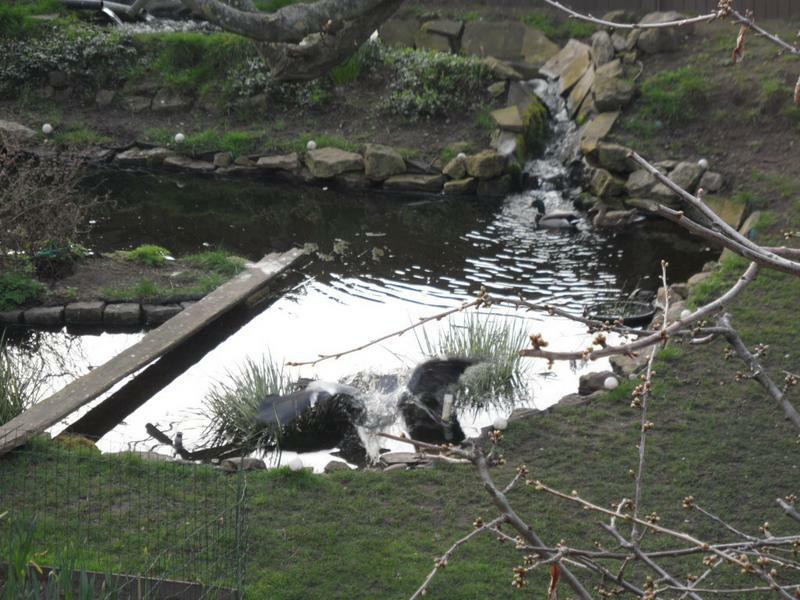 can be clearly seen, they will start to leave the water in a week or so. 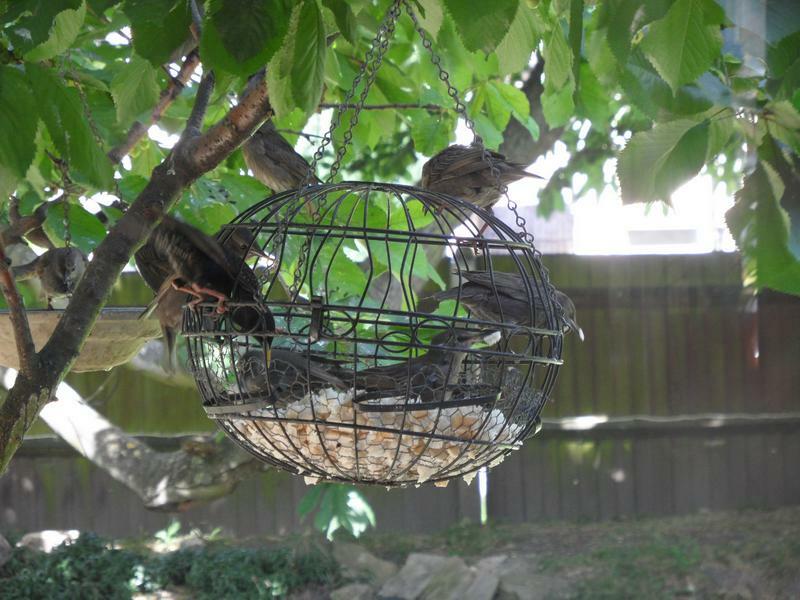 natural food on the trees and bushes.